Our asparagus crop has been fantastic this year. I have filled 4 gallon sized zip lock bags with asparagus over the last 5 days. I would guess each bag weighed at least 5 lbs and that’s a lot of asparagus for a family of 5. I should also mention that asparagus season isn’t over yet. I can’t seem to cut it fast enough and have already had a few stalks go to seed. In the past, we’ve eaten some, but a lot we gave away to friends and family. 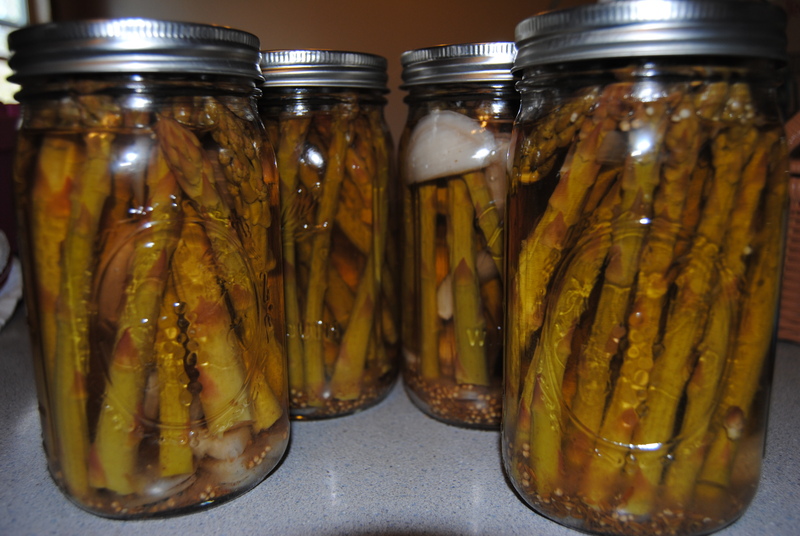 This year we wanted to preserve some for our own family, so Hubby sent me a link to pickling asparagus. It was a rainy day yesterday, with thunder rolling in the distance, so a good day to pickle some asparagus. I got out the supplies and before I knew it, I had 6 quart sized jars going into my water bath canner. Unfortunately, two of the jars broke, so only 4 jars came out, but it looks yummy. They will sit for at least a week before we open a jar and give them a try. Hopefully, they taste as good as they look. Is pickling a hard process? Never have done it but would like to give it try. Is there a website you can recommend ? Here is the recipe I used for Pickled Asparagus http://foodpreservation.about.com/od/Pickles/r/Pickled-Asparagus-Recipe.htm. I’ll let everyone know how we liked it after we open a jar for a taste. This is wonderful! Our asparagus has never come up. I do hope one day to have a crop like yours!